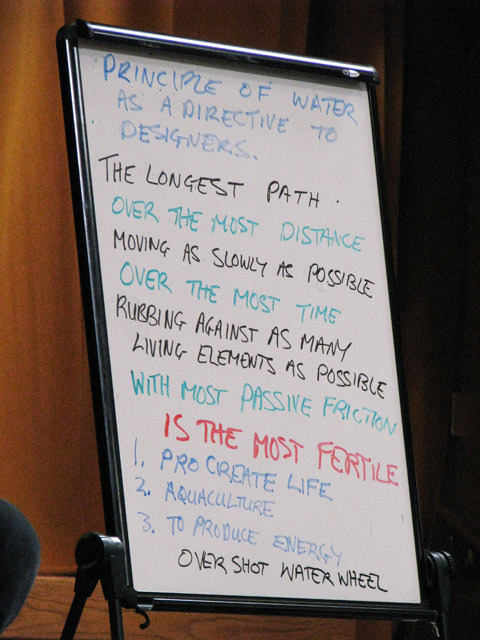 In October 2012, two months away from the big “2012 event”, after meeting activists and hearing of amazing projects at the Bay Area Permaculture Convergence, I decided to attend Geoff’s week long Advanced Permaculture intensive on Watershed Design, Earthworks and Food Forests. Even though I had completed many other Permaculture, surveying and Forestry courses, this week-long immersion with international Permaculture designer and teacher Geoff Lawton caused a pronounced deepening in me. I now “groked” a whole different way of thinking and seeing landscapes. Most of our big problems today are due to our resource needs. Lawton asked how do we move toward a “functional ecology economy” rather than the unsustainable “production/consumption ecology” that is currently consuming Nature and compromising our very lives and existence as a species? As Geoff points out, “once we turn around and orient towards living resources and sensible [input-output] energy audits, then we all go into an earth repair mode, which is a design priority direction.” Without this reorientation, how can we possibly call ourselves civilized or developed? Permaculture is an elegant, practical design system based on observing the way natural systems work, flow and interact. As designers, we notice the connectivity of the elements in natural systems and use that observation to create a system that provides for the needs of people while constantly regenerating and enriching the soil, land, natural systems and communities in which we live, work and play. Rather than continuously extracting and consuming commodities from a resource, we can work together with the land in smart ways to produce abundance and health for all concerned. How to Transform into Positive, Caring People? For most Permaculturalists, it all starts with water. Where there is water there is Life. Even in our local community there are opportunities to capture rainwater, re-use greywater, create “water wiggle ways” and swales that slow, spread and sink water into the ground resulting in re-hydration of the soils. There is no such thing as a level property. There are always transitions that provide opportunities and challenges. Permaculturalists are also fascinated by “edge” – where 2 or more microclimates meet. Edges provide sources of rich biodiversity, experimentation and discovery. There is literally a “pressure” created as 2 or more micro-climates impinge on each other. From this pressure and Nature’s lust for creative expression, all sorts of diversity and Life is expressed – some invade then die back, as succession transforms the landscape, each species preparing the ground for the next in the evolutionary line. Permaculture is one of the most fascinating concepts to emerge from our environmental crisis. And, we are just scratching the surface of the possibilities and potential. Combining Aquaponics, Food Forests, swales and water catchment systems etc., the possibilities to help our brothers and sisters – be they amebas or humans or… – is truely only limited by the mind of the designer. Learn more about Permaculture and discover resources and edge opportunities available on your property with a “Permaculture Walkthrough.” Turn challenges into solutions – dreams into reality.